The Tickell’s blue flycatcher (Cyornis tickelliae) is an insectivorous species which breeds in tropical Asia, from the Indian Subcontinent eastwards to Southeast Asia. Its range stretches across all the countries from India to Indonesia and are found in dense scrub to forest habitats. The Tickell’s blue flycatcher is a small bird, that grows to a length of about 11–12 cm long. It sits upright and forages mainly in the overgrowth. Apart from flying insects they have been noted to occasionally glean crawling insects as well and are also known to feed after dusk. The name commemorates the British ornithologist Samuel Tickell. Hummingbirds are well known for their ability to hover, as are insects. However, hovering is a much more rare concept in larger animals, such as birds of prey. 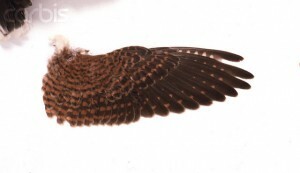 Birds of prey typically maintain their altitude while hunting by gliding around in circles, in order to generate lift. Kestrels, however, are the only bird of prey capable of hovering. Unlike smaller hummingbirds, kestrels are incapable of beating their wings fast enough to generate enough lift to keep them aloft, so they have to face into the wind and rely on it to provide lift for them. This “windhovering” technique is so precise that their heads stay completely still, a factor that is estimated to increase their hunting efficiency tenfold. In average wind speed, the kestrel can glide quite comfortably, flapping its wings at an almost leisurely pace. Although the kestrel flaps its wings as if it were flying normally, its forward movement is cancelled out by the wind, keeping it in the same position. The wind catches not only on the wings of the kestrel, but also on its tail. The tail, already broad, is spread out a bit more and depressed, so that it increases the surface area that is exposed to the oncoming wind. The effects of the tail depression are more obvious when the kestrel is preparing to hover. Before hovering, kestrels tend to glide for a bit and shoot upwards before any hovering actually takes place. During this upward movement, the wings are still outstretched from the gliding, but the tail is tilted downwards. 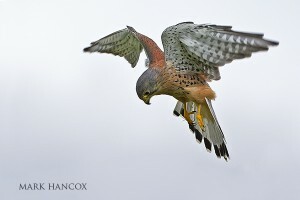 It is thought that this depression of the tail feathers checks the forward momentum, halting the kestrel in midair. The design of kestrels’ wing feathers is equally important to its ability to hover. Like other birds of prey, kestrels have slotted high lift wings, and these slots help to reduce turbulence while hovering. If the wings didn’t allow air to pass through them, kestrels would not be able to hover, and would keep stalling instead. Although the name “windhovering” suggests the use of wind to hover, some sources claim that kestrels can hover without any wind at all. Their bodies are shaped such that with outstretched wings, kestrels automatically glide forward. This forward movement is cancelled out by rapid wing beats. The downstroke is oriented slightly forwards, like it’s banking before a landing, which pushes the kestrel back in order to negate the forward movement. Hovering without any wind is a lot harder to control, however, and requires a bit of a balancing act. When the kestrel loses its balance, it will often slip forward before regaining control and hovering again. Kestrels will often slip about three times before either moving on or circling around to try again, depending on the possibility of finding prey. You will find the original article here. Talking about Goa, the first few things that conjure up in the mind are the beautiful beaches, the shining sun, exotic holidays, alcohol (for those inclined towards that) and of course relaxation. I am no different. I had a chance to visit Goa for the first time about 7 years ago for a vacation with my family. Never knew then, that there existed another side to Goa covered with greenery. The Western Ghats, which form most of eastern Goa, have been internationally recognised as one of the biodiversity hotspots of the world. Western ghats are well known for their rich flora and fauna. According to Wikipedia, Goa’s wildlife sanctuaries boast of more than 1512 documented species of plants, over 275 species of birds, over 48 kinds of animals and over 60 genera of reptiles. Goa has many famous ‘National Parks’, including the renowned Salim Ali Bird Sanctuary on the island of Chorao. Other wildlife sanctuaries include the Bondla Wildlife Sanctuary, Molem Wildlife Sanctuary, Cotigao Wildlife Sanctuary, Madei Wildlife Sanctuary, Netravali Wildlife Sanctuary, and Mahaveer Wildlife Sanctuary. During the period from 2014 to 2016, I have the privilege of making five visits to Goa (twice during the rains looking for amphibians and reptiles (herping) and thrice during the December – January months for birding). You arrive at Goa (either at the airport or at Madgaon railway station). You are driven to the far east side of Goa, to the outskirts of Bhagwan Mahaveer Wildlife Sanctuary. After about 15 minutes of driving, you find yourselves surrounded by lush green forest. It is a sight to behold and the weather too is pleasant. Nestled in the middle of the greenery, we arrive at the resort which is one of the best places to stay and explore. Near the resort, we can easily spot Little Spiderhunter, Purple Sunbird, Forest Wagtail, Malabar Hornbill, Vernal Hanging Parrot (the only parrot found in India) and many many varieties of birds during year end. But that is not belittling the rainy season in any way, as we get to see a wealth of amphibians, insects and reptiles. We also visit Bondla Wildlife Sanctuary, Tambdi Surla, some interior parts of Goa and finally a visit to Zuari River & Maina lake. During the months of December and January, we have 6 sessions of birding in which one can easily see over a hundred species. We also have a night trail to catch a glimpse of nightjars, frogmouths and owls just outside the resort. During the visit in the rainy season, we get the opportunity to visit Mhadei Wildlife sanctuary. It is an hours drive from our resort as we pass through the scenic beauty of the western ghats. The tracks of Mhadei are full of blood sucking leeches. Anti leech socks are a must-wear during the trail. Walking through the woods while it is raining is a unique experience. The evening trail at Tambdi Surla is fascinating. The thrill of walking in the darkness with humidity, coupled with the pouring rains gives goosebumps and it is definitely a not-to-be-missed experience. A visit to Zuari river is an opportunity to get a glimpse of six species of Kingfishers viz White-throated, Pied, Common, Collared, Black-capped and Stork-billed. Other birds to sight include Osprey, White-bellied Eagle, Greater Crested Tern, Peregrine Falcon. If you are lucky, you will also get to see ‘mugger’ crocodiles. The Western Ghats, spread over six states in western and southern India, cover an area of approximately 165,000 sq. km. They are far more ancient than the larger and better known Himalayas. The Western Ghats forests, rivers, and grasslands contain an extraordinary diversity of species, including rare and threatened species and endemics found nowhere else in the world. The widest belt of forests along the western ghats is in Goa and neighbouring Karnataka state.